Menendez is a Democrat who serves as New Jersey's senior senator, having served in that office since 2006. And he's in a bit of serious legal trouble. 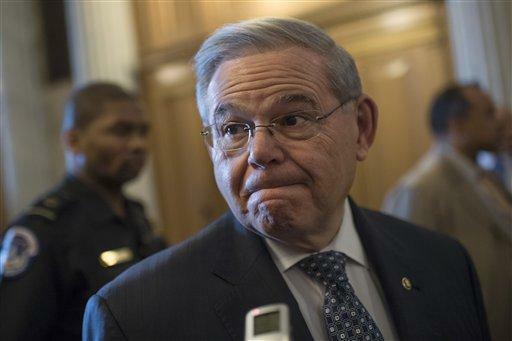 Bribery charges, which could send Menendez to jail for the rest of his life if he's convicted. It all stems from his relationship with Dr. Salomon Melgen, a Florida ophthalmologist who donated a lot of money to Menendez -- nearly $800,000 -- over the years. In April, federal prosecutors alleged that in exchange for all that cash Menendez started doing Melgen a lot shady favors. These included travel visas for Melgen's girlfriends, pressuring the Obama administration to change Medicare rules in such a way that would make Melgen millions, and push through a port security deal Melgen had a hand in. As part of the alleged quid pro quo, Menendez also travelled on Melgen's private jets and stayed at his mansion in the Dominican Republic. Menendez insists that the charges are baseless. "Prosecutors at the Justice Department don't know the difference between friendship and corruption," he said in April. Later that month, Melgen plead guilty to 67 counts of Medicare fraud. It's expected to go for about two months, according to Politico. Will he be able to vote while he's being tried? Sure, although the case has already cost him his lofty perch as ranking member on the Senate Foreign Relations committee. But if he's convicted he'll leave office, right? Not necessarily. Being convicted of a crime doesn't result in automatic expulsion from office, and only four senators have been convicted while in office. Three of them resigned, while Sen. Ted Stevens was defeated in his 2008 re-election bid after a (later overturned) conviction was handed down. This is where it gets tricky. Given how closely split the Senate is, the last thing Democrats want to do is lose another member and increase the GOP's majority in the chamber. And in New Jersey, a vacancy would be filled by Gov. Chris Christie, a Republican and ally of President Trump. Remember that the Obamacare repeal effort failed in the Senate by just one vote, so if Menendez is replaced by a Christie-appointed Republican, they could go back and try it again. Does that means he'll stay? Potentially, or at least for a few months. The exceptionally unpopular Christie will leave office in the middle of January, and is almost certain to be replaced by Democrat Phil Murphy. This raises the potential of Menendez deciding to stick around until Christie leaves, or just trying to hold onto power indefinitely. Well, can the Senate get rid of him? Yes, a process outlined by Article I, Section 5 of the Constitution. It would take a two-thirds majority to expel a senator, meaning Republicans would need to vote unanimously to expel Menendez and get at least 14 Democrats to help them out. Here's the thing, though: It's very rare for the Senate to expel a member. So rare, in fact, that it's really only happened once – in 1797, when Tennessee's William Blount was expelled for treason. Another 14 senators were kicked out during the Civil War, but that's because they were openly supporting the secession of their states from the Union, and therefore already leaving. Other senators, such as Oregon Republican Bob Packwood in 1995, resigned when it became clear they would likely be expelled otherwise. But this is not a normal time, meaning Menendez may be pressured to stick around for a few months by Democrats who would otherwise be anxious to get rid of him.